Designed to minimize flow resistance while maintaining low dead space. Double-swivel elbows allow flexible positioning of circuits. Self-sealing, ported elbows permit suction or bronchoscopy without ventilator disconnection. 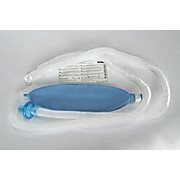 A high concentration, high flow oxygen diluter with adjustable PEEP. 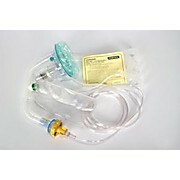 This system allows for variable flows, variable O2 concentrations and variable PEEP, all in a pre-packaged kit suitable for the ambulance or ER. Quick, easy-to-use disposable kit that is easily transferred from pre-hospital to hospital. Pressure Controller designed to continously monitor tracheal cuff pressure. Single-patient use devie, reduces potential for infection and elminiates sterilization issues with quarantined or isolated patients.